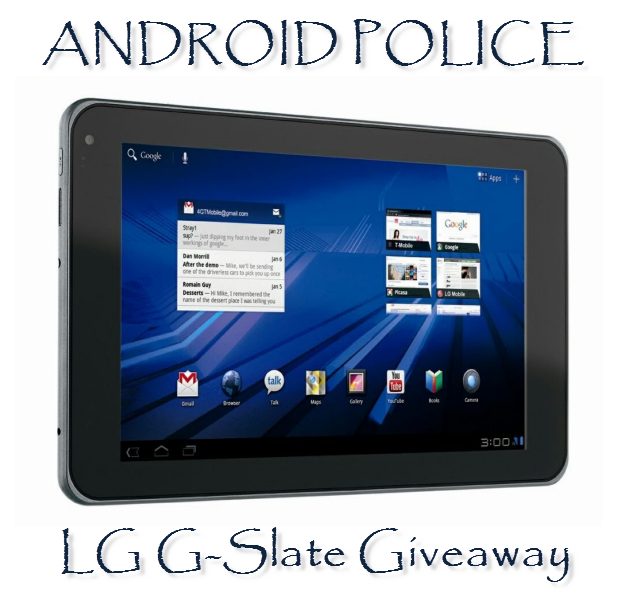 [Giant Giveaway #2] Win A Free LG G-Slate 3D Honeycomb Tablet For Doing Close To Nothing! Our first giant giveaway was a huge success, with lots of excited entries received from many countries around the world in the 2 weeks it was running. In the end, one lucky winner - Keef from the UK - walked away with a free XOOM Wi-Fi, excited beyond belief. While we could only pick one winner for that giveaway, I promised that more would be coming, one more awesome than the other. 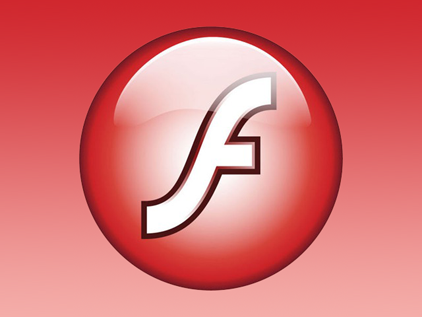 The latest update to Flash 10.2 for Android (version number 10.2.157.51) hit the Market earlier today and introduced several enhancements, most notably hardware acceleration for 720p videos (mentioned here earlier), albeit only on Honeycomb tablets. Browser integration in Honeycomb has also been improved, and "important bug fixes and security enhancements," including a fix to the "critical" vulnerability discovered a few weeks ago, have been made across the board - not just in Honeycomb. The G2x isn't the only exciting high-end device making its Magenta-colored debut today; LG's 8.9-inch G-Slate is having its coming-out party on this fine Wednesday as well. Now, T-Mobile would happily lure you into a two-year contract with an attractive starting price of $529.99, but a wise tablet buyer would immediately note that taking such a route would cost a total of $1250 over the next 24 months - not to mention the toll of being unable to upgrade to the latest and greatest in the rapidly changing world of tablets. 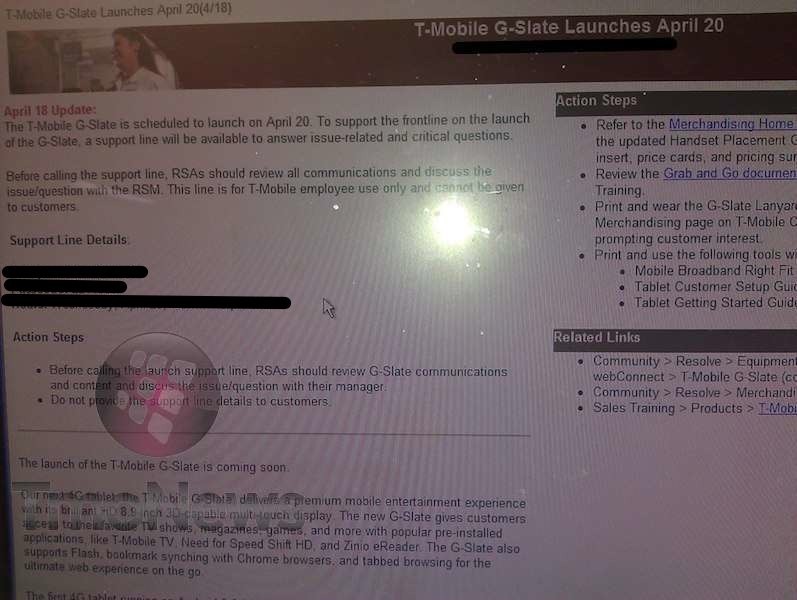 Update: It's true - against all odds, T-Mobile has confirmed that the G-Slate will indeed be launching on April 20. Just one more day, folks! 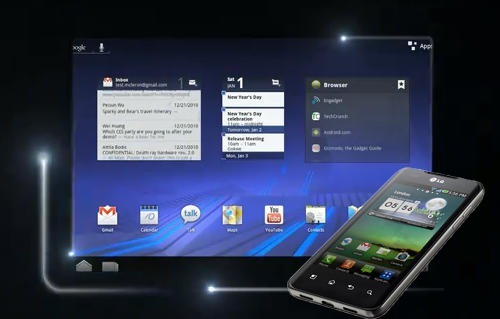 Listen up, 3D fanatics - according to TmoNews, LG's multidimensional G-Slate will go on sale on April 20th. It's not the first time we've seen this date thrown around, and it would certainly make sense given the fact that two of T-Mobile's other flagships - the G2x and the Sidekick 4G - are also launching on 4/20. The new G2x dual-core phone with stock Google experience is not the only device getting some attention today in a slew of T-Mobile press releases - both the G-Slate 3D tablet made by LG and the Sidekick 4G made by Samsung finally got pricing information. 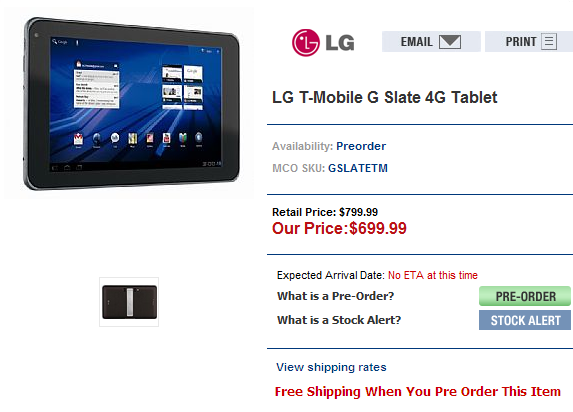 First up, the 8.9" G-Slate tablet running Android 3.0 "Honeycomb" will cost $529.99 after a $100 mail-in rebate (ugh). Don't get too excited though - this price is for a 2-year contract, in addition to a voice line (hmm? Remember that onslaught of dual-core smartphones and Honeycomb-running tablets we have been anticipating for a while now? It has already begun - and it is only going to keep on growing. The latest rumored release is for the LG G-Slate and G2X, which, according to TmoNews, are both set to launch at T-Mobile stores on April 20. 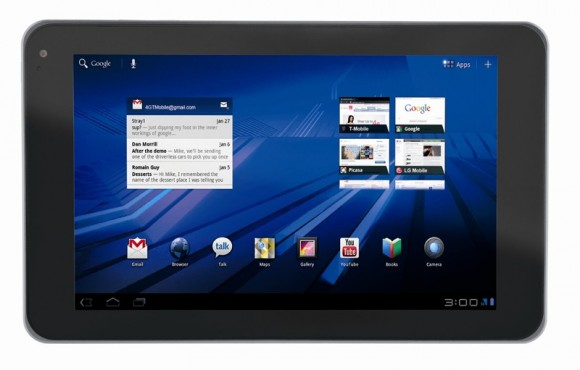 The dual-core G-Slate (also known as Optimus Pad) will be, along with the upcoming Galaxy Tab 10.1, the first Honeycomb-running rivals to give the Motorola XOOM a run for its money. LG's 8.9" tablet will be the first to incorporate 3D technology, and, like most other new tablets we will be seeing soon, it will have Android 3.0 'Honeycomb' under the hood. 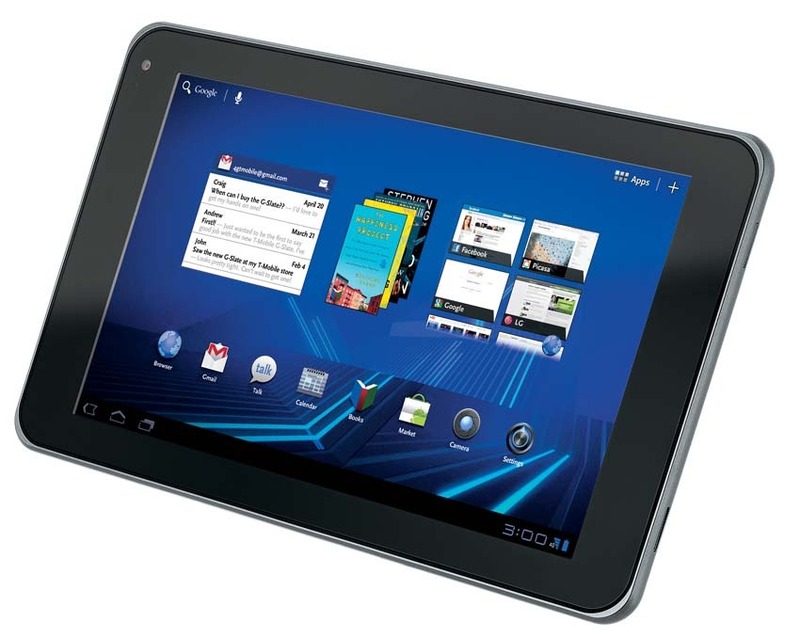 Yesterday's announcement by Samsung of the Galaxy Tab 10.1 might have seemed like something of an echo of the Motorola XOOM. 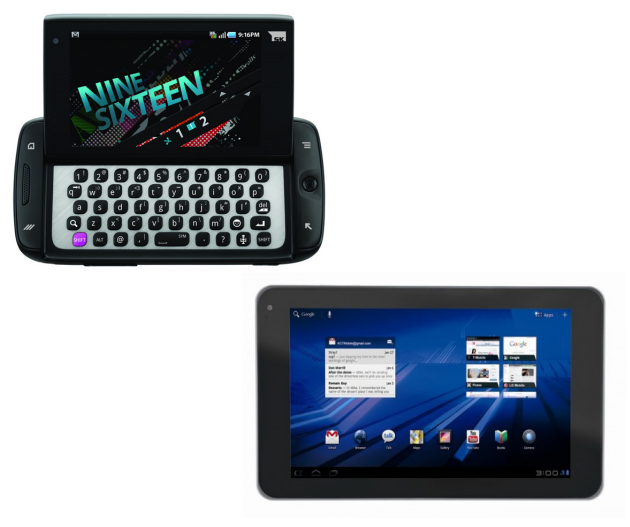 Well, with LG's recent unveiling of the Optimus Pad at MWC, we can still see some resemblance but with a few alterations making it worthy of further attention. First up, the Optimus Pad refrains from the somewhat popular 10-inch screen diagonal seen on both Motorola and Samsung's tablets. If you have doubts about the handiness of a 10-inch device, it seems that LG shares your sentiments: the Optimus Tab scales the display back to 8.9 inches, while maintaining a similar 1280x760 WXGA resolution.